Metal ceilings have been used in building design for several years. These ceilings originated all the way back in the 1880s and were used as a more affordable way for people to dress up the space. It was also a functional choice back then that served as effective fire protection for homes and businesses. This was extremely important because back then, their lights and source of cooking came mainly from the use of open flames. They are still being used in today’s modern design and aesthetic because they offer a more affordable alternative to other materials, they come in a variety of colors, patterns, and styles, and are still just as functional. They provide fire protection, insulation, and require minimal maintenance but are still durable and are made to last. Despite their early popularity, metal ceilings lost traction during the mid-1900s because of the Great Depression. There was a much-increased demand for the steel and metal materials used to make these ceilings due to World War II. However, the popularity of these metal ceilings would make a strong comeback years later. However, they would utilize tin materials that were more readily available during and following the war. 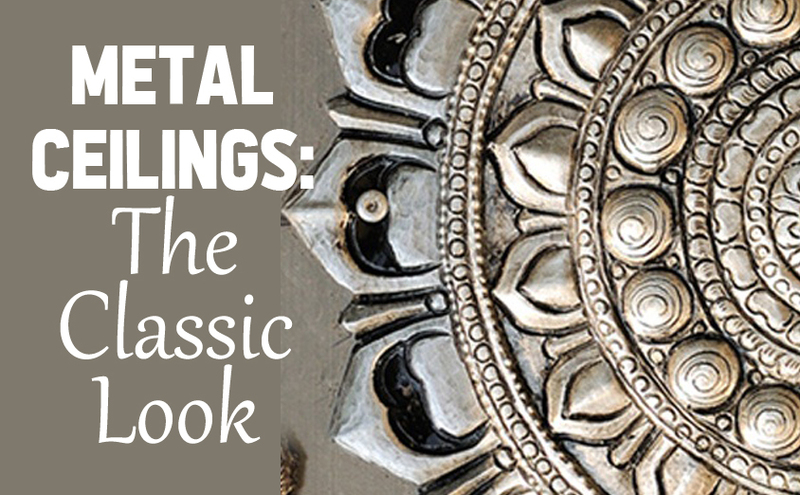 Since the metal ceiling tiles were so strong and durable and were made to last, their historical significance is preserved in older buildings from the previous century, and they are still in good shape even today. Metal ceiling tiles throughout history were most commonly used in more commercial applications such as in churches, schools, libraries, train stations, hotels, and other public locations. Although, you could also find them in many residential applications as well. Between 1890 and 1930, there was an influx of metal ceiling tile manufacturers with about forty-five companies going strong in the United States. Most of these manufacturers were located in Ohio, Pennsylvania, and New York. People began adopting the metal ceiling tile look because it was reminiscent of European style and offered a very classic look. There was also a time in which artists were commissioned to create elaborate patterns for the metal ceiling tiles to be used in the home. When put together, the tiles would create a detailed and ornate design. This also gave the illusion that the tile was much more expensive than it actually was which gave the home a feeling of richness and wealth. Metal ceiling tiles were often used on the walls and ceilings of old hotel lobbies to add some drama and character to the building in addition to its more practical benefits as stated above. They were also lightweight, easy to install, and relatively inexpensive and made a good alternative to wallpaper or paint. They were often used to cover up old and worn existing ceilings that were in desperate need of repair because it was more affordable for the shopkeepers then replacing and repairing the original walls and ceilings. A classic tin ceiling design included the tiles, molding, filler, and cornice and were installed using intricate patterns. These ceilings were often used as focal points in commercial and public buildings like churches in the early 1900s. However, they were also used to adorn residential homes as well and mimic early European style. The ceilings could be used in more elaborate and drastic designs or could be used as smaller accents throughout the space. Due to the nostalgia and history that come with metal ceiling tiles of the past, there has been quite the demand for restoration over the last few decades. Metal ceiling tiles are definitely in style for more modern applications today, and with the large variety currently available, they can be used in several applications throughout a home or business. They add class to any room while also introducing intricate designs, beautiful patterns and colors, and different metals that coincide with a number of different themes and styles. Patterns of the past included many intricate and elaborate designs and embellishments. They also used color, borders, and beautiful patterned designs that nodded to the Victorian style of the time. For more of a Romantic revival, homes would also incorporate texture along with the elaborate designs of the metal ceilings in the home.